The Pyramids of Giza immediately come to mind in terms of mind-boggling works – perhaps the most notable of the Seven Wonders of the Ancient World. But consider for a moment a structure that according to one ancient visitor, “surpasses even the pyramids” in its astonishing scope, ambition, and ability to rewrite ancient history. It was descriptions of this kind that inspired the creation by of the HORUS Foundation (Herodotus Original Research Using Science), an organization dedicated to assembling experts and state-of-the-art technologies from the aerospace industry to maximize archaeological research in relation to the written record of Herodotus. The plan was simple enough, obtain permission from the Secretary General of Egypt’s Supreme Council of Antiquities, and thereafter use Ground Penetrating Radar to see what might lie under tons of sand. 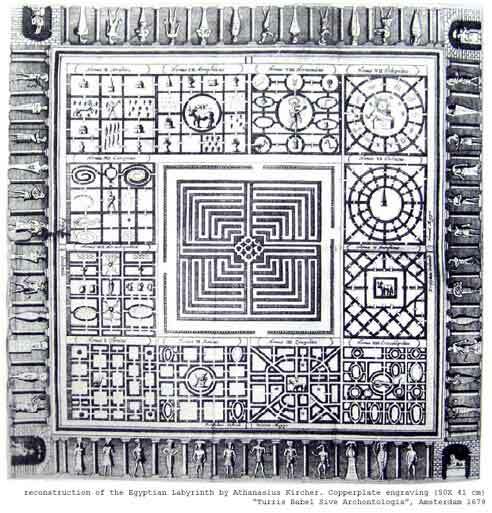 After scans in February and March of 2008, the results were officially announced by Egyptian authorities on August 11, 2008 to wit: “The Mataha-expedition discovered the lost labyrinth of Egypt at Harawa”… pretty much where Herodotus had suggested, near the place called the City of Crocodiles . There is, of course, the small (Herculean) effort needed to move a great deal of sand, drain the site from groundwater intrusions, and ultimately uncover enough of the site before the more skeptical archaeologist might be willing to admit to an unambiguous “discovery”. Furthermore, this work would be done always with careful and meticulous attention to preserving this astounding heritage from the ancient Egyptian world. Much of the early funding of the project was done by Louis De Cordier of Belgium, a contemporary artist with a vision of combining art and science to enable research and preserve among other things Egyptian antiquities. The key element was the donation of proceeds from the sale of Cordier’s Golden Sun Disk, the latter incorporating sacred geometry, earth sciences and astronomy, in effect “an archaeological artifact of the future.” In fact, what better means of uncovering and preserving ancient artifacts is there than by creating a future artifact to support the research? Strabo (ca. 64 BCE – CE 19) in three passages in his Geography (Book 17, I, 3, 37, and 42): “Before the entrances there lie what might be called hidden chambers which are long and many in number and have paths running through one another which twist and turn, so that no one can enter or leave any court without a guide. And the wonder of it is the roofs of each chambers are made of single stones and the width of the hidden chambers is spanned in the same way by monolithic beams of outstanding size; for nowhere is wood or any other material included.” Strabo goes on to describe “a great plain of stone”, and a palace for assembling, speaking justice and bringing offerings for the Nomes of Egypt. Archaeological finds show that the site was continuously occupied up to the 7th century CE. William Flinders Petrie (1889) believed what he had uncovered was the foundation of a great temple, measuring 304 meters (997 feet) long and 244 meters (800 ft) wide. This makes it large enough to hold the great temples of Karnak and Luxor. The urgency now is that the groundwater is likely increased in its severity since the building of the Aswan series of dams in the twentieth century. It is entirely possible that the groundwater has in this time protected the Labyrinth from thieves, but the possible deterioration of the structure due to the salt content in the groundwater makes the preservation of the site a matter of world wide importance. "There comes a tide in the affairs of men, which taken at the flood leads on to fortune, omitted, all the voyage of their lives is bound in shallows and miseries." William Shakespeare, Julius Caesar, Act IV, Scene III.